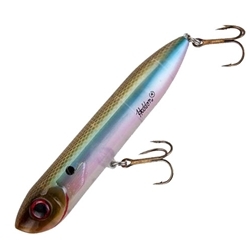 For more than a half a century the world has known that the Heddon Spook is the finest topwater walk-the-dog lure on the market, and despite the countless copies, none captured lightning in a bottle like the Spook. Now anglers can add another version of this fish-producing lure – the Chug’n Spook – that will spit tremendous amounts of water while producing the classic side-to-side sashay that drives fish wild. The Chug’n Spook features an open, cupped mouth that spits loads of water and creates enormous surface action. Despite the addition of the spitting mouth, the Chug’n Spook still walks-the-dog with ease, creating that hypnotizing action that predator fish can’t resist. The Heddon Chug-n Spook Jr. brings big surface commotion in a small package.